Heather Facilitating a Mindfulness & Leadership Excellence Workshop at the Maryland Hospital Association. In a world where multi-tasking, digital distractions and continuous partial attention are the norm, it is challenging for 21st century leaders to find the time, energy and creativity to innovate. Fortunately, the practice of mindfulness – paying attention to the present moment with an attitude of open awareness – can wire your brain for leadership excellence, even when you work in a fast-paced, high-stakes environment. During this workshop, you will learn simple yet powerful mindfulness-based exercises that will cultivate the four fundamentals of leadership excellence: focus, clarity, creativity and compassion. Learn to lead from a place of choice, based on your values and expertise, rather than reactivity. You may also experience better health, a deeper connection with others, and a greater satisfaction with life – at work and at home. Heather Stang is a meditation teacher and yoga therapist who teaches nurses, physicians, and mental health professionals mindfulness-based techniques to improve mental focus, executive functioning, and cultivate emotional balance, while improving the quality of patient and practitioner self-care. 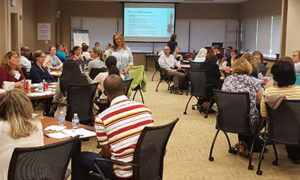 She has offered mindfulness training for leadership and selfcare to organizations that include the National Hospice & Palliative Care Organization (NHPCO), American Association of Occupational Health Nurses (AAOHN), Association of Death Educators and Counselors (ADEC) and the Maryland Healthcare Education Institute (MHEI). Heather holds a Master’s Degree in Thanatology from Hood College, is an IAYT Certified Yoga Therapist, and holds three certificates from the Phoenix Rising School of Yoga Therapy. She is the author of Mindfulness & Grief, and is the founder of the Frederick Meditation Center in Maryland.